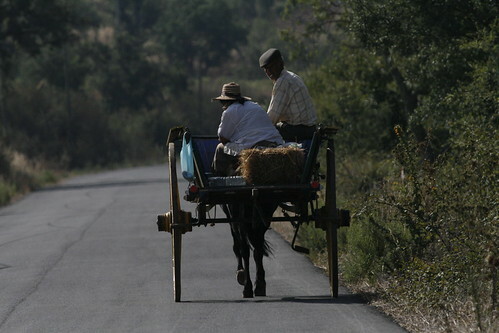 Horse & cart, originally uploaded by Paradise in portugal. This is our first link between Flickr and our wordpress blog. We thought that this rather timeless photo of a horse drawn cart was a good start. As I sit here it’s just started to rain outside and I’m smiling fit to bust. No, I’m no masochist, and I know that it sounds truly funny for an English/Irishman to be smiling at the rain, (especially for those who know me well and who know I’d rather be on two wheels than two legs), but for those of us lucky enough to be living here the rain is something very special. It last rained here three weeks ago and before that it was a clear four months, and, though having the sun every day is gorgeous, one hankers after the rain after a long dry period, so you may understand better now why I’m looking like a Cheshire Cat. The garden gets watered, the dust on the track settles down, the plants just spring into action, (especially at this time of year when the earth’s still so warm), insects hatch and emerge all over the place and every living organism takes advantage of the bonus …. in short there’s suddenly a huge increase in Life in general. There’s more food for everything right the way up the food chain and it’s all made the most of as quickly as possible, stocking up for winter. But the Cheshireness of my appearance right now is not only to do with the rain; it runs deeper than that …. I remember a few years ago leading a birdwatching trip out to the Plains the day after the first big rain of the year; everything was very fresh, the summer’s layer of dust had been washed from the leaves of all the trees and overnight the first new grass was sprouting through the earth, dusting the countryside with a patina of green. It was marvelous to see the difference from the previous week and to feel Nature bursting at the seams, but the truly amazing sight was all the raptors feeding on the flying ants. The latter emerge at the first sign of a chance to make a new nest, and that’s invariably when the rain has made the ground easier to burrow and food more plentiful, but they were so many in numbers that day, (recourse was made to the windscreen wipers more than once), that the birds were gorging themselves on them far and wide. Everywhere one looked there were Kestrels, Buzzards, Kites and Eagles, as well as the Shrikes and other insect eaters that one would expect. I’ve never seen so many raptors in the sky at the same time – no, I lie, that accolade goes to the day last year when I lucked into a stream of Booted Eagles on their way south, (over 200 over our heads at the same time) – but that day on the Plains came a very close second and in some ways was more magnificent. After all, everyone’s heard of The Migration, but I’ve never heard of The Frenzy of the Ants, so I reckon I’ll be taking a quick trip out there tomorrow just to see if I can catch the repeat; beats watching one on the telly, doesn’t it just?! The details are unclear as yet but somehow he lost control of his car on the “Straight Mile” half way to Santa Clara, spun off the road and burst in to flames. I found out early this morning as I drove in to the village; Susana, Nuno’s sister in law, was there with the local police from Saboia. The car was a good thirty meters from the road, a silver and black shell, (and I couldn’t understand why none of the surrounding vegetation had caught fire until I found out later that, by coincidence, an ambulance had been the first on the spot, barely seconds after the accident). Susana was in tears along with Nuno’s mother while the Police looked on sadly and hopelessly. He was universally liked, not least by myself and everyone here at the Quinta, as being always helpful and friendly, ready with assistance and local knowledge to ease our path here through the intricacies of social contacts and relationships, who was related to who and how, and why asking X would ease the granting of a request or procure some supply that the same X apparently had nothing to do with. He saw the Quinta differently and with greater understanding than some who live close by and did his best to help us, positive, jovial and respectful. He worked unloading the eucalyptus from the lorries onto the trains at the station, and the machine seemed to be a projection of his will. I will miss him, as will all who knew him. The funeral will be large, probably the majority of Santa Clara and Cortebrique. As with most locals, Fatima’s also closely related and I had to break the news to her when I got back to the Quinta. The funeral will be tomorrow. It was difficult therefore to celebrate the joy of a couple who announced their engagement at breakfast. With Fatima in tears in the kitchen and Daniela and myself deeply saddened by Nuno’s news, the mood was flatter than it should have been; understandable, but very sad. Of course in a way these two occurrences unwittingly spotlight the change taking place hereabouts, the seeming demise of the local population and the influx of outsiders. It is brought ever closer with each passing year; ten years ago two of my children were the only foreigners out of 17 in one of the three local primary schools, (whose total number of pupils reached into the 30’s), a sad enough statistic for a total local population of approx 600 souls. Now there are 6 “foreigners” in a school of only 12, while in the interim the two other local primary schools have closed through lack of pupils. So, as the demographic base has expanded, so the total numbers in primary education have crashed to unprecedented levels in the endemic population. There are fewer and fewer children and more and more people over 60. There are as many Germans moving into the area as Portuguese, and their age ranges differ startlingly, the Germans being in their 30’s and 40’s or even younger, while the Portuguese are, almost to the last individual, retirees. What is even more worrying is that the “Suicide Season” is almost upon us and, as the economic crisis in Portugal deepens and we enter the lean months of winter, it promises this year to bring a rise in its tragic harvest. There were three in the first six months of the year in our surrounding three villages, one in each. What is worse is that even though the average age of the local population as a whole is sadly over 50, a large proportion of those who kill themselves is, more often than not, in their most productive 30’s and 40’s. Very few local youngsters stay here once their education is finished, so this loss of hope by a large number of those that do, is doubly frightening. At present there is still some fat stored from the summer, but once that fat is consumed …. Maybe it is, as Fatima fervently believes, a sickness that one can catch; if so I wish they’d find a cure! For most people staying at the Quinta it’s a family holiday or R&R but more and more guests come to the Quinta for the birds and wildlife, and for them there’s no easy answer, so if this is what rings your bell, here are a few tips. Spring, which stretches for us from late February through to the end of May, is stunning and is of course when most Nature lovers congregate here; the flowers are out and changing almost by the hour, (huge swathes of purple, red, yellow and blue set amidst a backdrop of the brightest green), butterflies flit from place to place and all the birds are in their breeding colours, so bright it seems unnecessary to view them through binoculars … and yet there are still more colours when one does! The daily promise of better and better weather prises loose the last links of the chain that’s bound us tight since last November and the soul longs to soar free, up there in that azure void – y’see, I get carried away just thinking about it! Summer has the guarantee of weeks of solid sunshine as the temperature rises, and the Quinta’s great for holidays for the whole family, even when only a fraction of it wants to look at nature. All that lush greenery outside of the Quinta’s garden slowly fades, replaced by dry brown stalks, sticky cistus and clouds of dust, the memory of rain fading with the grass. Personally, having been born in Africa, I love this period, when the very earth smells of heat and the search for shade is constant – of course living right beside a clean freshwater lake might have something to do with it too! Then there’s the Autumn, always an interesting time, and for Birders full of surprises. I count it as starting at the beginning of the last week in August, when the Bee Eaters gather in larger and larger flocks and then finally they’re gone; (from my experience close to the Quinta, always within 36 hours of the 31st, matching their arrival in the Spring which is within 36 hrs of the 1st April – they really are the Swiss of the Birding World!) They’re closely followed by the Swallows, and then everything seems to be moving around too as the southward migration gathers strength …. Who could ever forget the sight of over 200 Booted Eagles overhead as we saw last year? Or, last week, a total of more than 70 Gt Bustards seen in a single day? Which brings us to Winter, though I can’t really call anything winter that doesn’t get below freezing point – it seems a bit of a sham – perhaps I should just call it The Wet Season, but even that’s a bit of a misnomer as on occasions it produces a grand total of 2 misty mornings during its 4 months! On others it really does earn its name and every ten years or so we have a storm to beat all storms, (the one in November ’97 dumping over 5 inches of rain in two and a half hours ….). Even during these months though there are things to see, sights that take one’s breath away, from the beauty of the Bluethroats to the surprise of having up to seven Robins within 2 meters of one whenever digging in the garden ….. I suppose the wealth of food dampens their normal aggressiveness; they certainly turn their collective noses up at any bird seed I put out! So, …. when’s a good time to visit? Anytime that suits!